For over 25 years our team at Asphalt Specialists, Inc. has been servicing Southeast, Michigan. We have a team of long term, highly-trained members who will provide a plan and services to fit a customers needs. ASI emphasizes quality in all aspects of construction; from design to underground to stone base to asphalt paving. Our "core values" are what keep us strong. We use these values every day, not only in work but in life as well. We are proud of what our company has become and we look forward to the seasons to come. The owners, Dan Israel and Bruce Israel are actively involved in day-to-day operations. If you have any general questions, you can call our main line at 248.334.4570 or check out our Meet Our Team for a specific department. For over ten years, ASI has been one of the only asphalt companies in Southeast Michigan to specialize in soil stabilization. This is the use of Portland cement or Lime mixed into the existing soil to provide strength. As one of the largest private buyers of asphalt in Michigan, our pricing is competitive, and with our experienced asphalt paving crews, our quality cannot be matched. 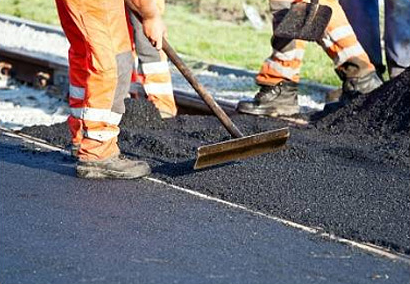 ASI specializes in performing asphalt repairs. Saw cutting, removing, and replacing deteriorated asphalt, as well as more complex asphalt repairs, are what we do on a daily basis. We're always looking to hire great people to join our team. We train and develop our employee skills in line with the ASI way.